Some early recipes also called for red wine and ketchup. But by 1900, the dish evolved into its more recognizable form as a white soup of fish or clams, sometimes containing potatoes, usually topped or thickened with crackers. In Boston, you can still find clam chowder everywhere from college cafeterias to high-end restaurants. 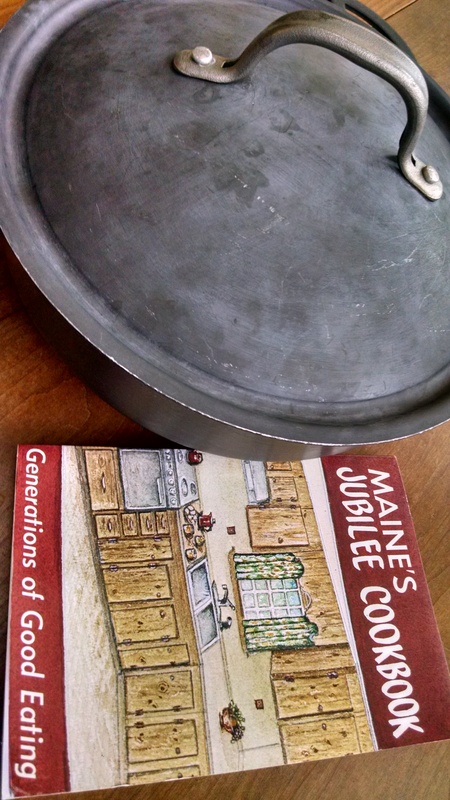 In my search for a chowder recipe to try, I picked up a copy of Maine’s Jubilee Cookbook, edited by Loana Shibles and Annie Rogers, first published for the state of Maine’s Sesquicentennial in 1969 by Down East Books. Many of the other recipes looked intriguing: Slippery Elm Bark Tea for “stomach disorders”; Spud and Spice Cake made with mashed potatoes, walnuts and nutmeg. 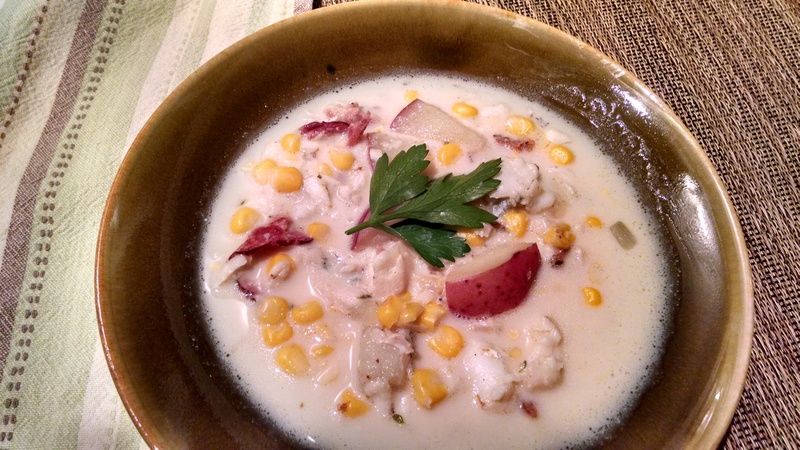 Yet for the chowder, I stayed with a traditional fish dish thickened with corn and potatoes. The recipe comes from a contributor named Mrs. Natalie Smith of Biddeford, Maine. She certainly adapted it for the modern pantry, using evaporated milk instead of cream, canned corn instead of fresh. That suited me fine, since I wanted to make a quick, hearty dish after an afternoon hike through the foliage. All too soon, I’ll be on cross-country skis. In a soup pot, fry the salt pork or bacon until lightly browned. Add the onion and saute until the onion is clear [soft and no longer white]. 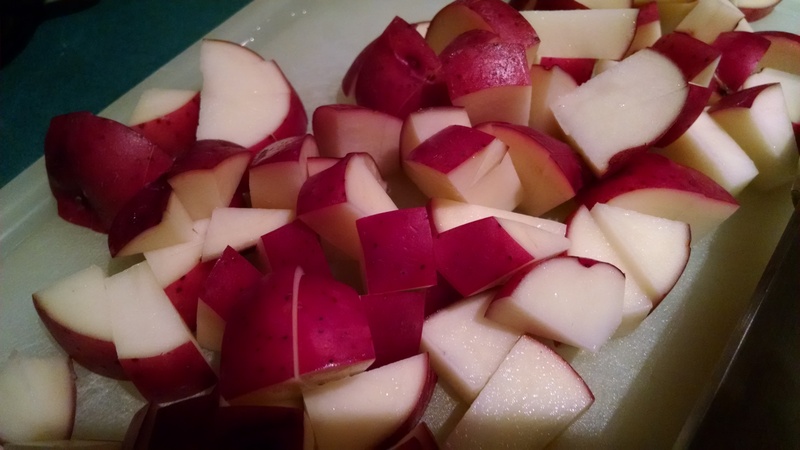 Add the potatoes, salt, pepper and water. Simmer for 15 minutes. Add the haddock and simmer for 15 minutes longer, or until the fish and potatoes are tender. Stir in the canned corn (do not drain) and evaporated milk. Heat through but DO NOT BOIL. Serve immediately. Garnish with crackers and parsley if you want. This entry was posted in cookbooks, Food, History and tagged Boston, Boston Evening Post, chowder, clam, corn, fish, haddock, Maine, Massachusetts, potato, soup. Bookmark the permalink.